My new favorite website: The Cereal Project! 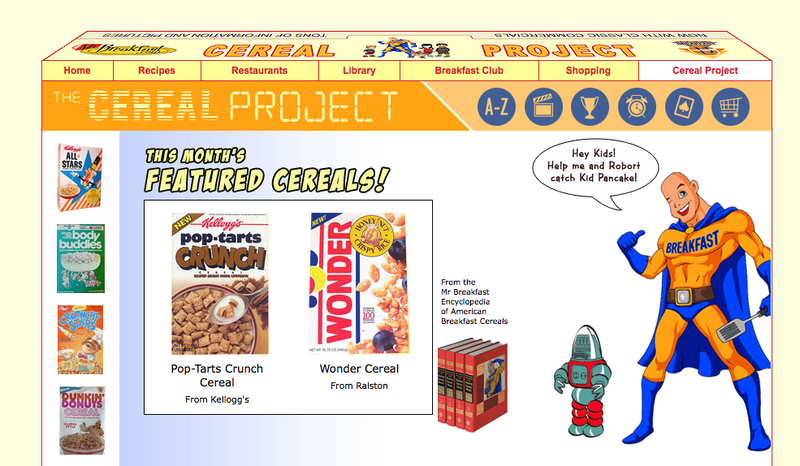 I bumped into the most awesome website ever just now: THE CEREAL PROJECT. I LOVE CEREAL. I love it with milk. I love it without milk. I love it during the day. I love it at night. Cereal is the perfect food. Right now my favorites are Cap’n Crunch, Honeycomb, Honey Bunches of Oats with Peaches, Cocoa Puffs, Froot Loops, Corn Pops, Kix, ok I like a lot of them. Even the site has an awesome design: it looks like a cereal box! They offer cereal coupons and also fun stuff like old cereal commercials and make your own cereal box print-outs! Do you have some nostalgic cereal favs? 16 Responses to My new favorite website: The Cereal Project! oh, and oreo O’s are due for a come back, along with pop tarts cereal. The plain unfrosted pop tarts are vegan. But yes, the cereal probably wouldn’t be either. Doesn’t mean I can’t reminisce. cereal is the best meal ever. cinnamon toast crunch is and always will be my all time favorite cereal. recently though, organic frosted flakes have become a true weakness. Mmm…my favorite cereal when I was little was King Vitaman and Berry Berry Kix! I think I need to go on a quest to find some King Vitaman now. Thanks for sharing this awesome site!! Oops All Berries Cap N Crunch, Cinnabunz, Rice Krispie treats cereal, French Toast crunch…original Trix…so many were my faves! Some of my best memories as a child was eating Lucky Charms out of my mom’s fancy coffee mugs. And growing up with a dad who is a cereal lover, it’s hard not to grow up as one too. I LOVE Cookie Crisp, Fruit Loops, Lucky Charms, and Raisin Bran. omg, and Holiday Cap’N Crunch with berries. You know, the Christmas one that you can for some reason find at Big Lots during June. Cereal in the uk is so boring. It doesn’t really come in many exciting flavours at all. I love lucky charms but you have to buy it from eBay sellers who import it for about £8 a box (about $14). I have serious cereal envy! I have a huge nostalgia of Lucky Charms. I only ate some when I was spending holydays in the US as a child and there’s none in France. the strawberry shortcake cereal looks so yummy! that and the barbie one looks great, now I want to get some yummy fun cereal, reminded me that I am out!